MUNICH -- Displaying its green-performance credentials, Bentley will unveil a high-performance sports car at the Geneva auto show in March with an engine that can run on E85 ethanol blend fuel. Bentley said the adaptation to running on green fuel was achieved by an enhanced engine management system and from newly developed transmissions and drivelines. 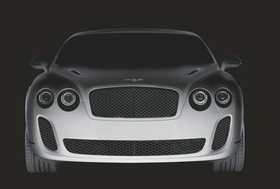 Bentley declined to disclose the cars name, price and volume, but said the car will go on sale during 2009. A Bentley spokesman said that the sports car will be positioned above its Continental GT Speed model, which has a 610hp engine and a top speed of 326kph. The base price for the Continental GT Speed is 207,501 euros in Germany. Bentley said the green car will have more power than the GT Speed, but declined to give performance figures. The cars styling was overseen by Bentley director of design and styling Dirk van Braeckel. The car will be Bentleys first model under its long-term strategy to deliver renewable-fuel vehicles throughout its range. Bentley claims it would be the first luxury manufacturer in the world to do so. Bentley CEO Franz-Josef Paefgen announced at last years Geneva show that Bentley wants to make all of its 8- and 12-cylinder engines capable of running on renewable fuels.